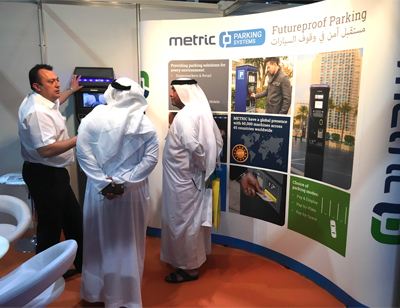 METRIC impressed visitors at Gulf Traffic with a parking solution specifically designed to suit the Middle Eastern climate. Customised to cope with ambient temperatures of up to 60° and with stainless steel housing that withstands the harsh sandstorms, METRIC’s parking terminals drew a lot of attention at the exhibition. Features such as the colour screen, banknote acceptance, credit card payments and smart card reader were also favourites with visitors to the stand. The solar-powered machine demonstrated the illuminated customer interface areas and backlit keypad for number plate data capture, while the mains-powered terminal displayed the new high-resolution video screen option, allowing for a new way to generate revenue.